Full booster box display containing 20 packs! Exclusive SP Gold Foil/Hot Stamp signed cards from the following original Japanese Voice Actresses. 4 rubber playmats (1 design) included per carton!! English and Japanese edition cards may be played together in tournament formats (Excluding Japan). However, language restriction may apply in major tournament formats. English edition cards cannot be used in official tournaments that are held within Japan. Certain card specifications will differ from the Japanese edition cards. 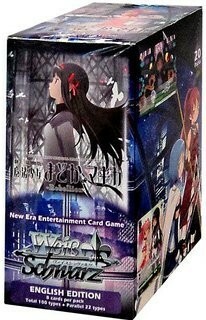 Weiβ Schwarz English Edition does not include gold/silver campaign coupon.